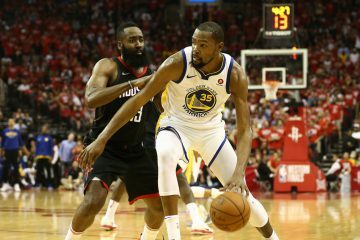 A lot has been made of the last possession of Warriors v. Rockets in Game 2. 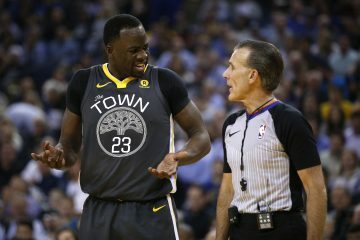 Why didn’t they call time out? Did Harden choke? 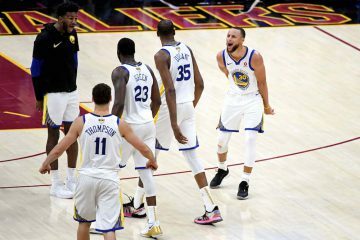 Did Golden State get lucky? I’m going to attempt to break it down. McHale has a point. Harden is one of the best transition players in the NBA. He is as hard to stop as anyone in the league. Statistically, not calling time out generates a higher percentage shot than calling time out v. a set defense. Add to it Golden State has the number one defense, calling time out would only make the look harder. With less than 10 seconds and a 1 point differential, Harden going with a head of steam is as good a look as the Rockets could hope for and most likely the right call. 4. 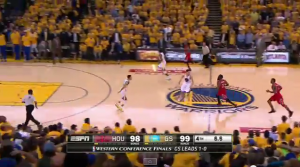 Recognizing the double team, Harden looks to outlet the ball to an open Rockets player. 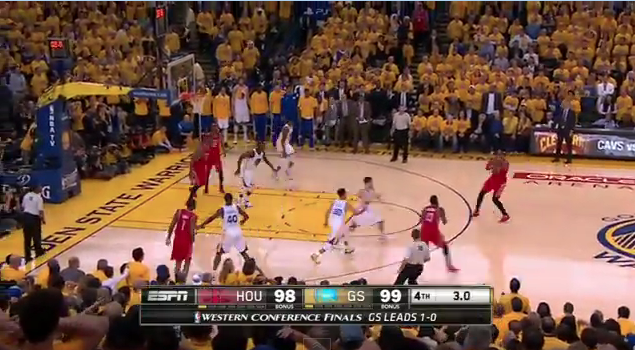 Ariza has ran to the elbow closest to Harden and is closely covered by Harrison Barnes with help (Curry) a step away. Brewer cuts under the basket where Jones is only clogging the spacing more. Both are heavily guarded and not options to receive a pass. The Rockets lack of spacing leaves Harden with only one viable option to pass to, Dwight Howard at the top of the 3 point line. Now lets rewind it a few seconds. 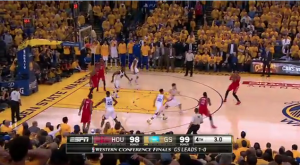 When Thompson opens his stance and invites Harden left, he commits to that direction. 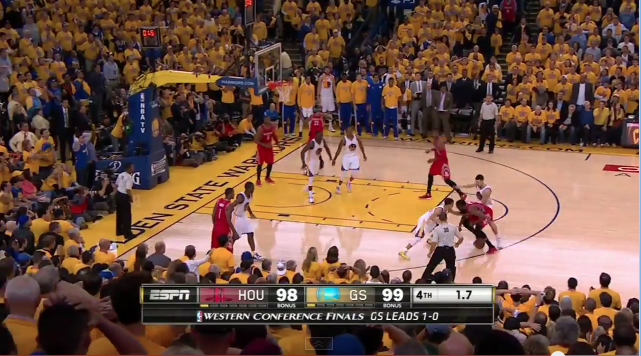 Ariza who is trailing the play probably should have gone towards the top of the key or the right elbow. His defender is trailing and being a dangerous shooter would have put Thompson in a position where he had to rotate over or leave him wide open. If Thompson didn’t rotate over, Andre Iguodala, who is guarding Brewer, has to commit to Ariza, thus leaving Brewer a wide open lane to the rim. Post game Harden said he did not know Howard was at the top of the key, noting he passed to the “first open red jersey” he saw. Most likely he believed it would be Jones or Ariza. 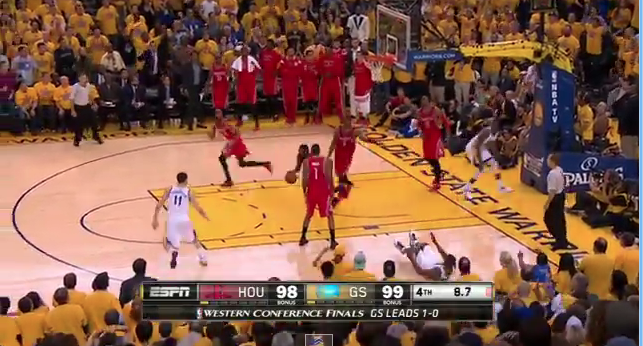 Jones went to the rim, and Ariza ran to the same area Harden was dribbling. At this point, it’s worth bringing up the time out. 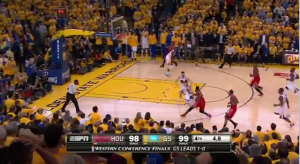 If Harden had noticed it was Howard alone at the top of the key he could have called time out with roughly 5 seconds left. Since he didn’t Howard should have called time out and re-grouped. Howard, not being used to having the ball in his hands in this situation likely didn’t consider a time out. 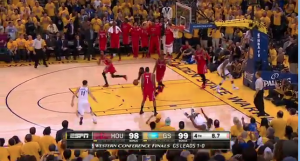 Golden State’s defense was set, the Rockets spacing was poor and nothing was there to be had. Howard, not used to having the ball at the top of the key passed it back to Harden who was double covered and we know the result. 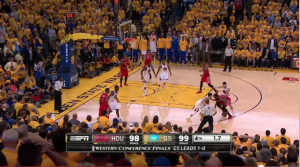 All and all, the Rockets plan to push in transition and not call a time out was correct but the execution was poor. 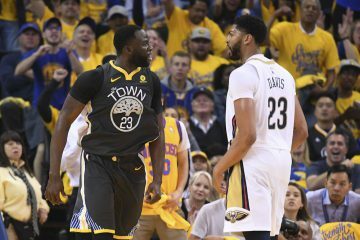 Golden State’s defense also deserves credit for getting back so quick. 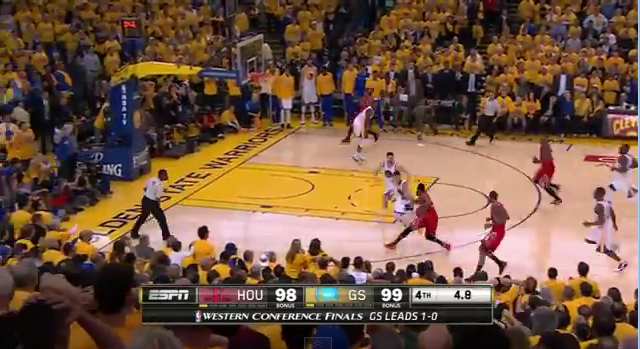 Thompson deserves credit for recognizing he has help (in Curry) and immediately corralling Harden left. Iguodala did well to recognize Brewers leak out and shadow him. 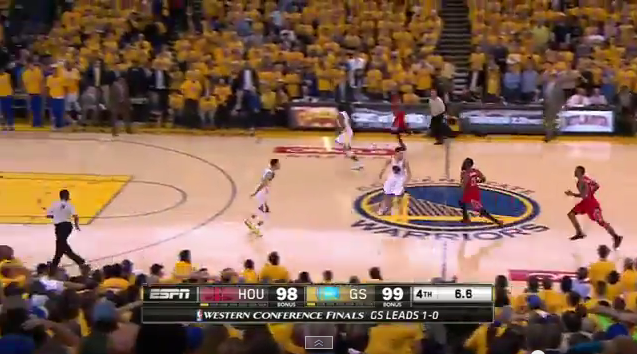 Golden State’s transition defense out-executed Houston’s transition offense. They communicated, guided Rocket players to help, and took away passing angles. 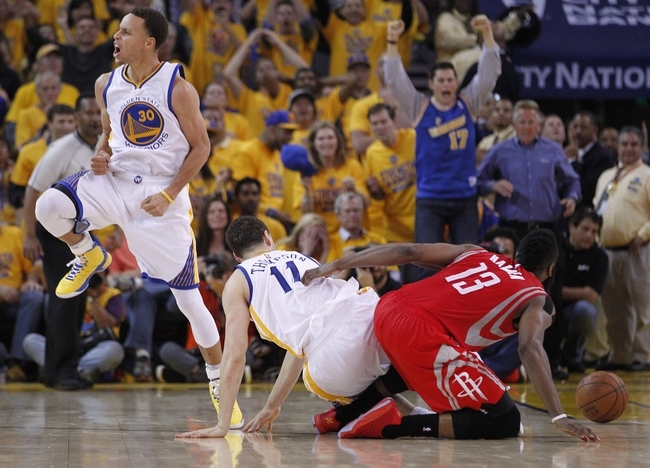 If Golden State does go on to win a title, defensive play will be as big a reason as prolific shooting.